Commercial grade gas pressure cookers give a new choice. - No polishing or soaking is required. - Uses higher steaming heat and pressure make cooking faster and save energy. - Produces better taste and texture cooking. - Extremely effective with high altitude area cooking. - Extremely effective with low temperature environment. 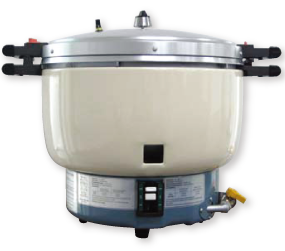 The JPC-1000 Commercial Grade Gas Rice Cooker is an energy efficient commercial gas pressure cooker that not only cooks rice faster than conventional gas rice cookers, but it also uses about 1/3 less power. It also cooks brown and wild rice, which are notoriously difficult to cook with commercial grade rice cookers. Combined with the multiple safety features, including the patented Safety Cap, the JPC-1000 is an ideal solution for safe, efficient, high volume production of various types of rice in a commercial kitchen. Gas Supply Pressure (Water Colum=WC) 6" W.C. 11" W.C.
Dimensions (inches) 22.8" x 22.4" x 18.1"